A trusted member of the Byzantine establishment, Procopius was the Empires official chronicler, and his History of the Wars of Justinian proclaimed the strength and wisdom of the Emperors reign. Yet all the while the dutiful scribe was working on a very different - and dangerous - history to be published only once its author was safely in his grave. 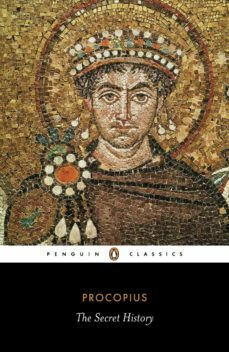 The Secret History portrays the great lawgiver Justinian as a rampant king of corruption and tyranny, the Empress Theodora as a sorceress and whore, and the brilliant general Belisarius as the pliable dupe of his scheming wife Antonina. Magnificently hyperbolic and highly opinionated, The Secret History is a work of explosive energy, depicting holy Byzantium as a hell of murder and misrule.